Red Terry-velour fingertip towels made of 100% cotton. Also used as Rally towels for sports events. One side is terry and other side is velour. 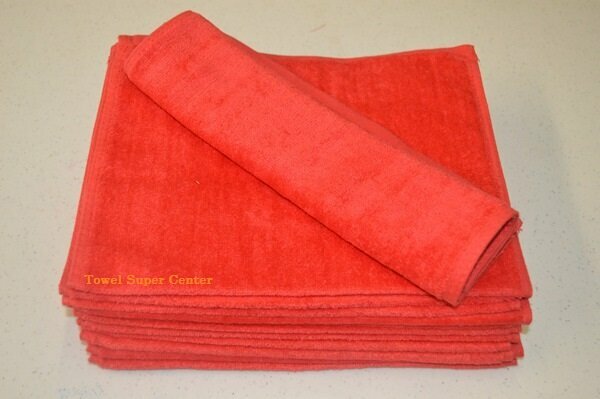 If you’re looking for colored terrycloth fingertip towels at bulk prices, Towel Super Center can help. We carry colored velour fingertip towels at wholesale prices — check out our selection and incredibly low prices. You want high quality colored fingertip towels that don’t cost too much, are delivered quickly and will withstand repeated washing. When you choose Towel Super Center for discount fingertip towels, you’ll join customers such as hotels, spas and country clubs that recognize the value we provide. You’ll also get the low prices you want with the quality and service you expect! Make Towel Super Center your online destination for selection, low prices and value today!